The Morriston Orpheus Choir is always on the look out for new recruits: Young or not so young. A solo quality voice is not essential but you will need the ability to sing in tune and be able to learn and retain an extensive repertoire as we sing without music copies. Just as important is the ability to blend in with others both musically and socially. We work hard at our music, but are not elitist. We are friendly and sociable with a wide spread and intensely loyal band of supporters. Have a look at our Special Features pages to get a flavour of what belonging to the Orpheus involves. So what's involved in singing with the Orpheus? Commitment certainly. You will be expected to attend twice weekly rehearsals and perform at concerts and other engagements in the UK and beyond, which average around 25 - 30 per year. To join you will need to undergo a short voice assessment so that the Musical Director (MD) can place you in the appropriate section and then you come on board as a "Probationer". "Probation" lasts for around six months, during which time there will be plenty of help on hand in learning the repertoire. The aim of the probationary period is to give you time to settle in and learn the routine, but also to show your commitment to the Choir through regular attendance etc. Towards the end of your probation the MD will offer you a final voice test to check that you are ready for staging and then the fun really begins. Whether its in a local Chapel or in one of the great concert halls of the world, singing with the Orpheus is an unforgettable experience. Speak to the current members of the Choir, many of whom have been choiristers for thirty years or more and they will quickly share stories with you from all parts of the globe. They will fondly recall visits to the USA and Canada, to Germany and France and to The Middle and Far East. Click here for a list of countries visited. 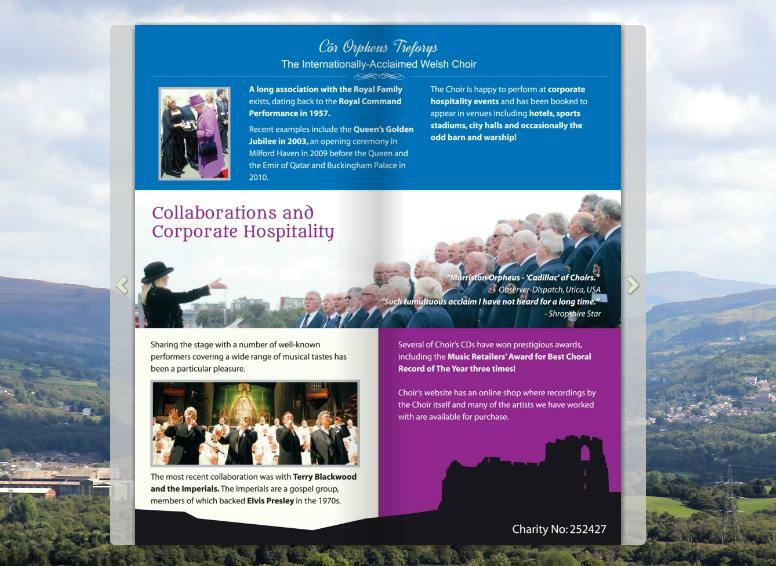 In 2009 the Choir toured Eire, singing at Ennis and Kilkenny Cathedrals, returning to the 'Emerald Isle' in 2011 and 2014. 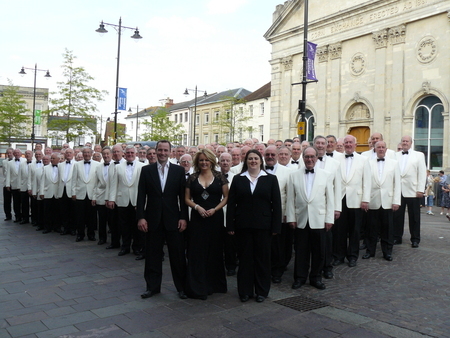 The Choir also performs all over the UK, for example at Llandaff and Coventry Cathedrals, 2011 with the 'Elvis in the Cathedral tour' and at Birmingham Symphony Hall in April 2016. We are always pleased to welcome young and not so young choristers. 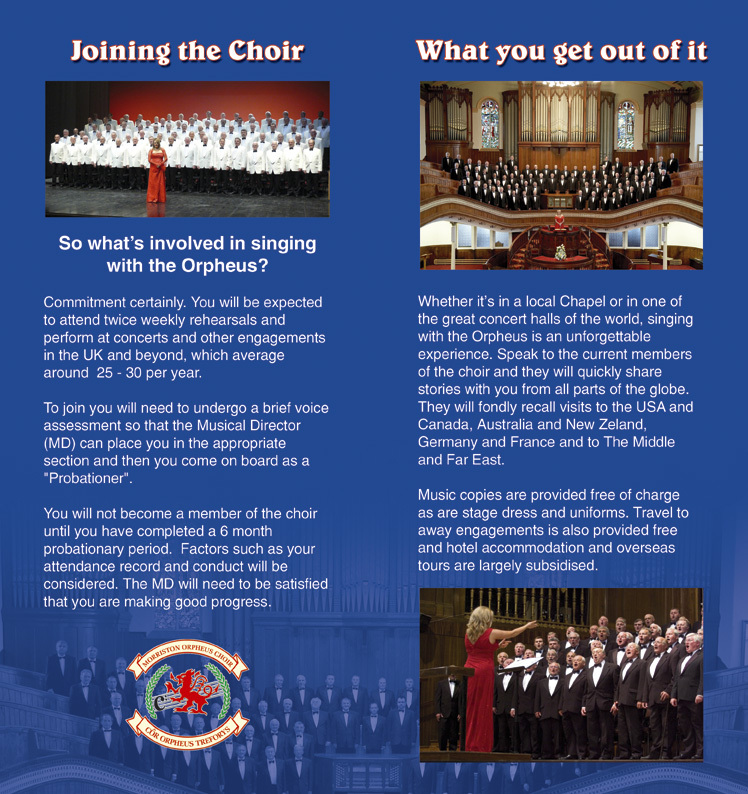 Age is no barrier and anyone keen to share the Orpheus experience is welcome to drop into one of our rehearsals in Swansea on Sunday & Wednesday evenings between 7.00 & 9.00pm, you'll be assured of a friendly welcome. For details give Adriam Walters a ring on 01639 766795, beforehand as occasionally rehearsals are postponed for various reasons.